I always wanted to be an architect. Unfortunately I’m very messy and that’s a bad combination. Building useful things, such as bridges and roads, would be a great job. My father was a history teacher and my favourite subject was history, but I knew I was never going to be a history teacher as I could see what it was like for him. I did law to keep my options open and was offered a job by Simmons, which felt like a phenomenally well-paid job. It wasn’t my life plan. I had training offers from a couple of Magic Circle firms, but I chose SJ Berwin because at that time they were at the forefront of private equity – it was a dynamic firm then. On qualification I wanted to be a finance lawyer and felt I would have got strong technical training in a firm like Freshfields. I moved to Kirkland as a fourth year to develop business. I felt there would be more freedom to develop client-winning skills as well as doing deals. I am happy with my choices. It wasn’t a conscious decision that private equity would be such a prominent area – I’ve enjoyed a lot of luck. In the end Macfarlanes’ response to the recession was very strong. We learned not to be frightened of change and our powers embraced this in a way which was very invigorating… I wish we’d responded a little sooner. But we got there and I’m proud of what we achieved. The firm got its mojo back. That wasn’t a given. We were phenomenally successful – we were a deal machine and managed to adapt in a way that the mix of the practice today is quite different to six years ago. There were different challenges during the downturn, you had to look to different markets. Challenges are always there and you are always after that next deal or that new client. I don’t think you could be here for 24 years without still being ambitious for that. Working on the bailout was very intense – almost surreal, sitting in the Treasury trying to figure out how best it should be done. There was a deadline for having to announce something before the markets opened on the Monday. We all started on Saturday morning and worked all the way through to Monday morning. There were three banks we were looking at: RBS, Lloyds and HBOS, and then the Lloyds/HBOS combination. Each had a different thing to think about, they all had their own lawyers so there were three sets of documentation. The challenges faced and the creativity needed to get that off the ground were a once-in-a-lifetime thing. 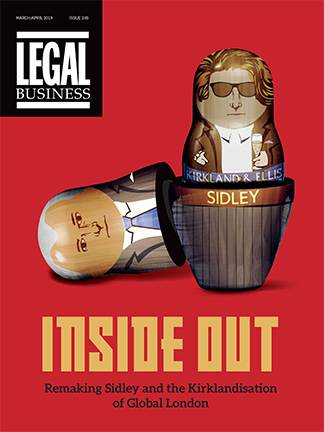 The first deal I worked on when I qualified at Allen & Overy (A&O) was for David Morley and everything went wrong. On the Monday morning, I went to his office and he saw the look on my face and said: ‘Helen, don’t bring me problems, bring me solutions.’ I turned around and walked out, but that stayed with me. The job of a lawyer is not to bring problems but to find solutions. I used to pretend I decided to be a lawyer at 16. My sister made a visit to me in London and one of our smarter associates asked: ‘So, tell us when Phil decided to be a lawyer?’ My sister said: ‘You were eight, weren’t you?’ She blew my cover. I’ve always been attracted to it. I don’t believe people that do well have an unerring right to succeed and it’s entirely down to their own abilities. Loads of incredibly able people don’t hit the right spot. I was very lucky that I started working as a lawyer doing something that I turned out to be good at. I could easily have done something else. I applied because I didn’t know what else to do. Law attracts people who are not just in it for money, but want that sense of professionalism and intellectual curiosity, and also people who want to work with other people. I became more entrepreneurial as I became older, but whether I am entrepreneurial, I’m not sure. I’m a team person, not a classic entrepreneur. It’s been an amazing career. I’ve been with Clifford Chance (CC) for 40 years. People had just stopped wearing bowler hats when I started, I was relieved to notice. What I remember was being in Royex House at Coward Chance. No air conditioning – we used to bake in the summer. People used to go out for lunches and have a bottle of wine a head and work in the afternoons. I remember watching then senior partners walking in at ten in the morning. They’d go for a long lunch with clients and go home at three. I thought one day that might be my life. Of course, it never has been my life. The City has changed completely. I’m a forward-looking type of guy. Looking back on your career is something you do when you’re retiring. At the bright chickeny age of 50 it’s not the right time to be looking back. In a traditional English law firm, when you come to 50 there’s this unspoken thing of ‘when are you going to go?’ It’s sort of like granny sitting in the corner. In a US firm nobody thinks you know anything until you’re at least 50. In 1980 I went from doing conveyancing in Manchester to international finance at Coward Chance (CC). The banking practice at that time had around five partners and we were left to our own devices. I got to spend a lot of time with clients, one of which was Citibank, where I went on secondment in 1984 – there were no in-house teams at that time so I was the only lawyer there. At that time, Chase Manhattan Bank was one of Allen & Overy (A&O)’s key clients. I remember going back to my senior partner at CC and saying I thought we could get a lot of work from Chase, and I was told not to bother. But I gave it a go and, eventually, they became one of CC’s biggest clients.